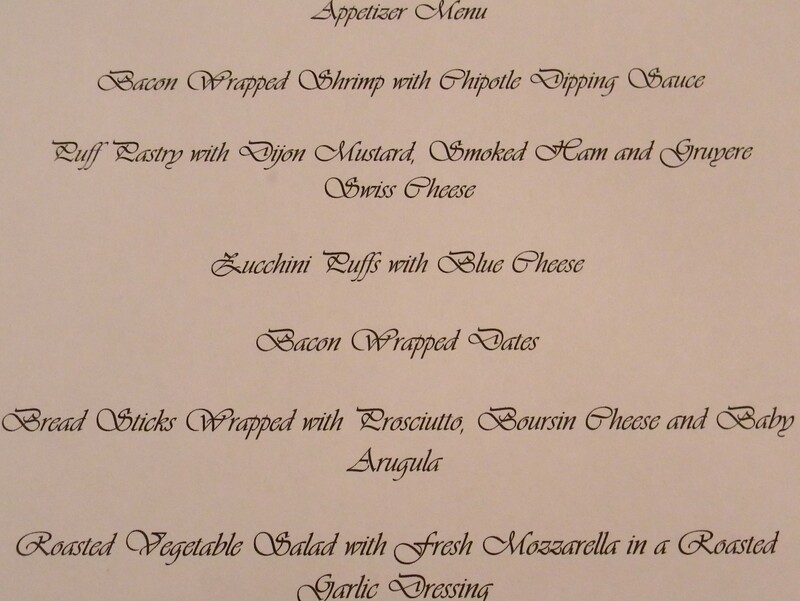 Here’s the menu from last night’s appetizer party. I like to print out what I’m serving. I think it’s nice for guests to know what they have to look forward to. It can also keep you on task with what you’re serving. 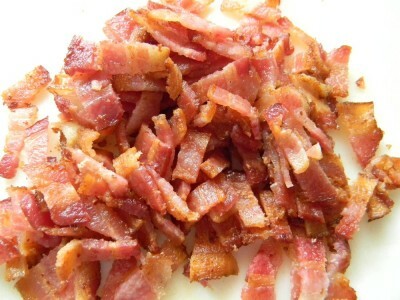 I saw Ina Garten prepare this appetizer recipe on Food Network. So simple that I didn’t need her exact recipe. 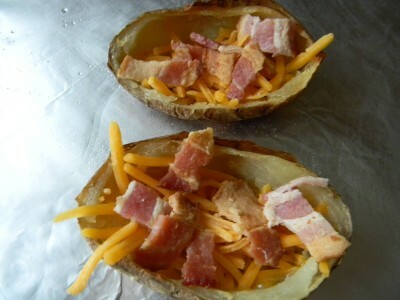 I think she used a thinly sliced deli ham in hers. I choose to use spiral cut smoked ham because I had some on hand. Either one works very well. The beauty of this appetizer is that you can make it ahead and simply warm it in the oven for 12-15 minutes before serving. It is equally delicious at room temperature. You could also bake it before guests arrive, time it so you take it out a few minutes before they’re due to arrive. That way your house will smell amazing when your guests arrive and you’ll be ready to serve after everyone gets their cocktail. It’s a perfect plan! 1) Preheat the oven to 375′. Defrost the puff pastry according to package directions. 2) Dust the counter top with flour and place the puff pastry sheet over it. Lightly flour your rolling pin and gently roll out the dough into a 12 x 18″ rectangle (approximately). Place the dough on a large parchment lined cookie sheet. 3) Spread an even layer of dijon mustard over the dough leaving a 1/2″ border. 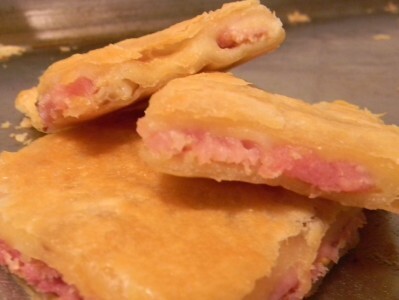 Layer the ham evenly over the pastry. 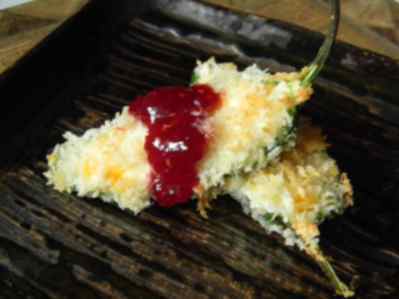 Top evenly with the shredded or sliced gruyere cheese. 4) Roll out the second piece of dough the same size as the first one. 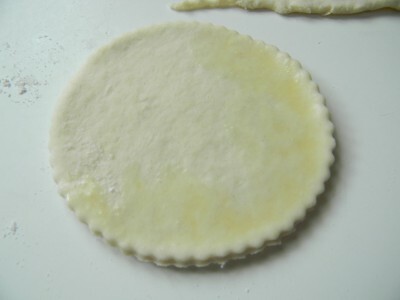 Brush the outer edge of the base puff pastry with the egg wash. Top with the rolled out puff pastry and press the edges together with your fingers. Using a fork, press around the entire outer edge of the dough. Poke 6 holes in the top of the puff pastry to release air while baking. 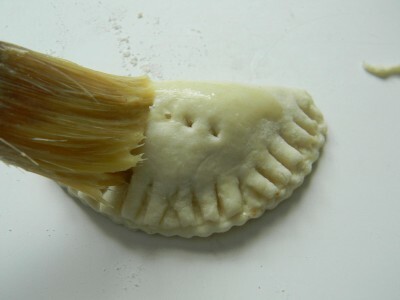 Brush the entire pastry with egg wash.
5) Place in the preheated oven. Bake for 30-35 minutes. The crust should be beautifully golden brown. Allow it to cool for 10-15 minutes minutes before serving. I’m at my computer with my Ry-guy doing homework next to me enjoying his goldfish with chopsticks. So cute. He’s really good at it! He’s a true foodie in training. I couldn’t be happier. I have been cold all day. I just put the biggest pot in the house on the stove with three turkey breast carcasses from my freezer, celery, onion and carrot. Soups on! Fortunately my vegetable drawer had soup essentials. 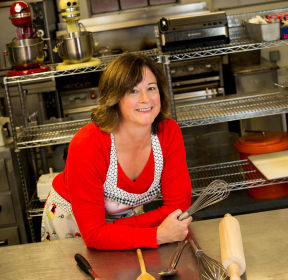 Since cooking in my awesome commercial kitchen I know more of what I have on hand there than at home. Last night I had to scrounge around for a fresh garlic clove! 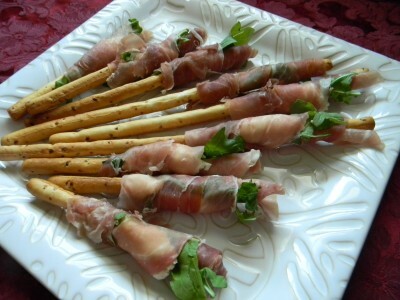 5) Bread sticks wrapped with prosciutto, boursin and baby arugula. 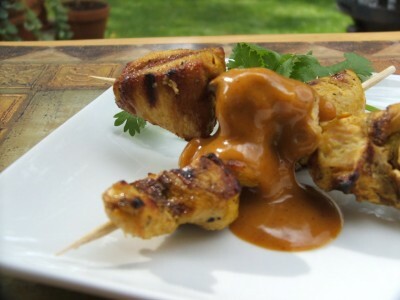 I made this Chicken Satay for our annual party a couple of years ago. I’m gearing up for one of my favorite parties..Cocktails and Appetizers! Every February, I like to throw an appetizer party to celebrate the the birthdays of my beloved in-laws. There are so many birthdays in the fourth quarter that I can’t keep up! My sweet Mother-in-law hosts in her lovely condo. 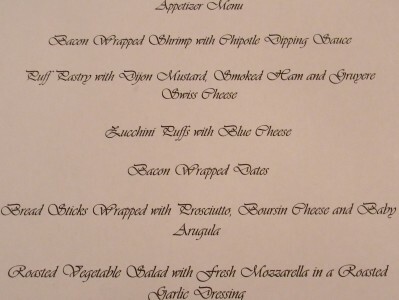 Everyone will bring their favorite cocktail and I’ll bring the appetizers and desserts and we enjoy a nice adult evening together. So fun! The fun actually begins with me pouring over recipe after recipe. I also have ideas in my head that sound good too. Thought I might like to make mini goat cheese balls that I could fry and serve with a warm marinara sauce… Joe gets tired of me asking what he thinks of different ideas because he knows I’ll most likely change my mind 100 times! Here’s what I’m thinking so far…. I’m about 99% set on my menu. I was all over the place! I thought a lot about Thai Spareribs , pork and chive pot stickers with dipping sauce and a spring rolls but they didn’t flow well with my other choices. I wanted some vegetable offerings as I didn’t want to serve all protein based fare. My menu tends to be mostly Mediterranean inspired dishes, which are always so good. I haven’t tried the Greek lamb meatballs but the recipe uses minced jalapeno peppers which will be great with the cool yogurt. Now I have to make a shopping list and get going! Looking forward to a simple cocktail/appetizer party on Saturday. As always, I obsess over what I’ll be serving. (in a good way!) In my experience I’ve found that most people really go for hot appetizers. I think it’s nice to offer a couple of cold items so that there’s something available between hot apps. Olives are nice. I like to offer some vegetables as well so that my guests have a healthy option. I love the look of blanched broccoli on a vegetable tray. *Blanching will make the broccoli very bright green and will make it less bitter. Serve fresh cut veggies with my Light Bleu Cheese Dip. No one will know it’s light, so good! Another thing to consider is whether your guests will mostly be standing and mingling. Always a good idea to serve items that are bite size and easy to eat. Be sure to have plenty of cocktail napkins on hand as well. If guests are a little shy about going up to an appetizer table, circulate them yourself or enlist another guest to do so. This will put everyone at ease. 1) Fried Calamari with Fresh Marinara Sauce (the sauce can be made ahead) Not sure about this one….like to have most everything done ahead of time! I have time before my gig, so I’ll be changing things around a bit. Will let you know my final menu. *to blanch broccoli, bring a large pot of salted water to a boil. Add the cut broccoli to the water and set the timer for 1 minute. Drain and immediately plunge the hot broccoli into a bowl of ice water. Once the broccoli is cool, drain well. Enjoy! Prosciutto & Boursin Cheese Appetizer….. 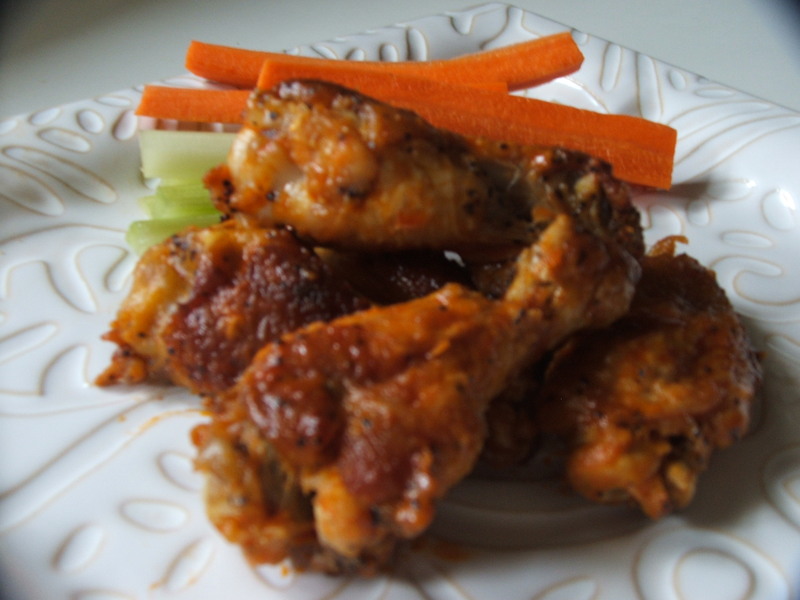 This is a very elegant, simple, and amazingly delicious appetizer! The best part? There is no cooking involved! If you like ham rolls with cream cheese, this is a bit more sophisticated. I used onion bread sticks, a blend of cream cheese and garlic & herb boursin cheese, baby arugula, and prosciutto ham. I was disappointed when I opened the box of bread sticks and half of them were broken. I decided that it made the plate look interesting to offer different sizes. 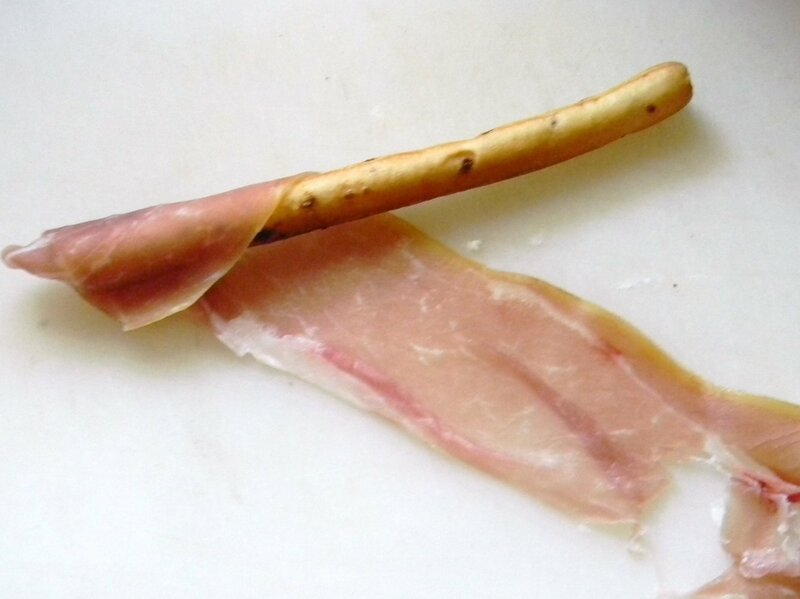 When you buy prosciutto, ask for it to be sliced slightly thicker than usual, which is paper thin. If it’s too thin it can be very difficult to work with. 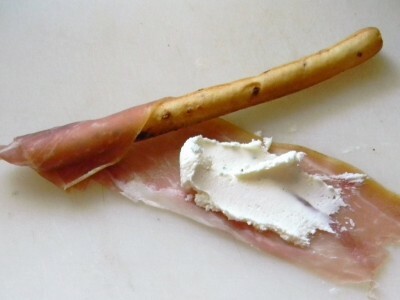 Cut the prosciutto in half longways. This ham actually sticks to itself nicely so they stay wrapped. I used a broken bread stick here. I just made sure that the prosciutto covered the broken top. Next add a smear of cream cheese and boursin cheese, beaten together with a hand mixer. Add a couple of pieces of arugula. Be sure that it’s completely dry after washing. Carefully roll the ham over the cheese and arugula. Done. Now taste one. Holy moley that’s good! 1) With a hand mixer beat the softened cream cheese and the boursin cheese until well blended. 2) Slice the prosciutto in half longways. 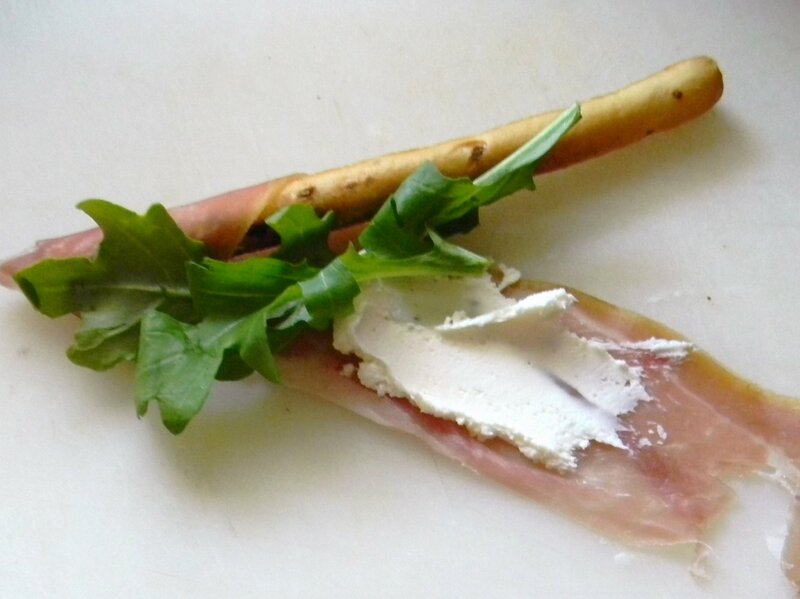 Wrap the tip of a bread stick with the ham, add a smear of the cheese mixture, add a couple of arugula leaves. 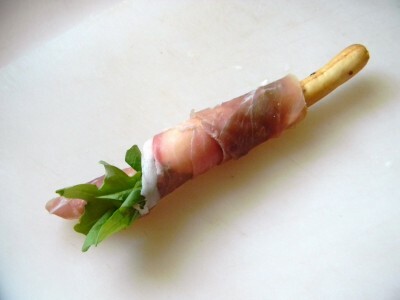 Gently wrap the ham around the stick. 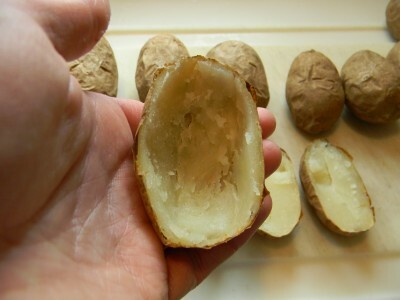 3) Refrigerate until you’re ready to serve. Makes about 10 servings. I had my good friend Amy over for dinner the other night for a belated birthday dinner. I just so happened to have a good size chunk of goat cheese on hand, one of my friend’s fav’s. How could I go wrong with fresh plum tomatoes, onions, and lots of garlic? I made it ahead and put in the frige. I popped it into the oven about 10 minutes before she arrived so it would give us a little time for chat and a glass of prosecco before we dove into the appetizer. It was savory, creamy and delicious. 1) Preheat the oven to 275′. Process the slice of bread until you have crumbs. Add the olive oil and pulse a couple of times. 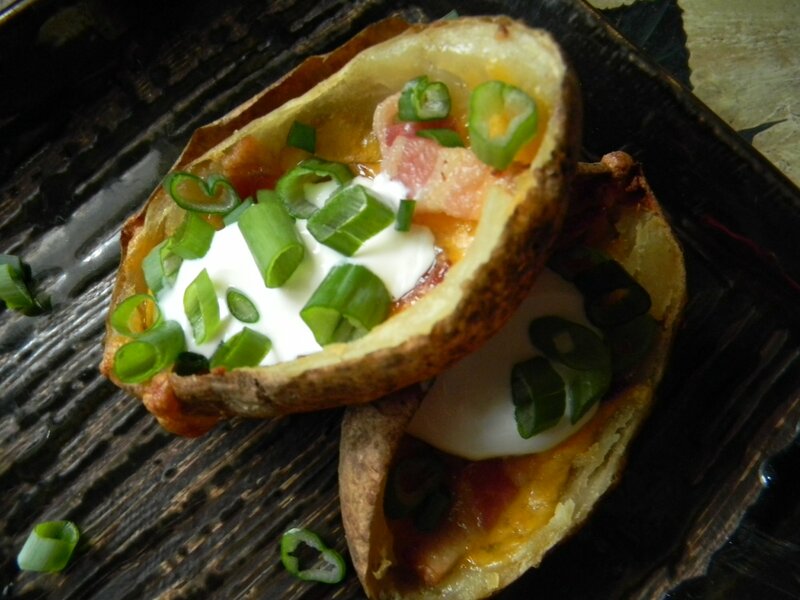 Spread over a cookie sheet and toast in the oven for 5-8 minutes, give them a toss after about 4 minutes. Bake a little longer if needed. You’ll want them to be evenly toasted brown. Watch them closely as they can easily burn. Remove from the oven and cool. 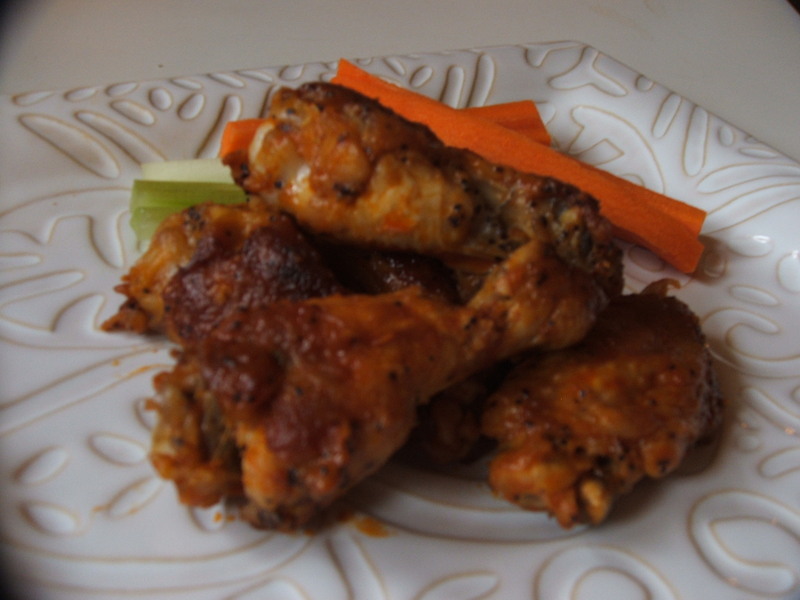 Turn the oven temperature up to 350′. 2) Heat a heavy skillet over medium heat, add olive oil. Saute the onions until soft, about 5 minutes, stirring often. Add the garlic and cook another minute. 3) Add the tomatoes, salt, pepper, and wine. Cook until most of the moisture has evaporated from the tomatoes, stirring often. Add the water. Cook until most of the water has evaporated. Remove from heat and add the basil. 4) Coat a small 3-4 cup baking dish with olive oil. Add the crumbled goat cheese. 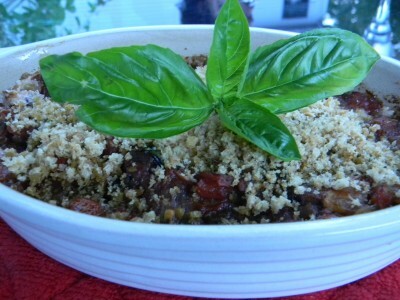 Top with the fragrant cooked tomato mixture. Bake for 20-25 minutes or until bubbly. Remove from the oven and top with the toasted bread crumbs. 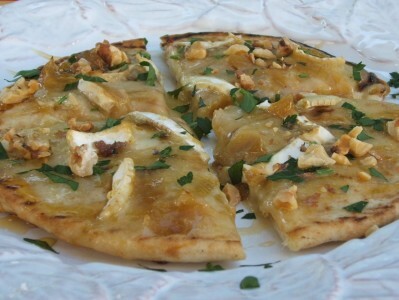 Serve with sliced baguette or pita chips. Serves 4. 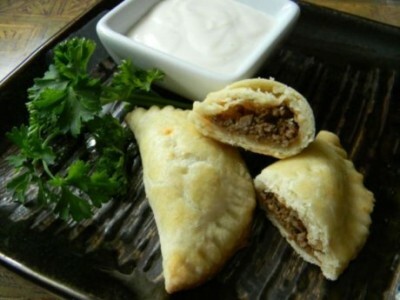 I came across this little stuffed meat appetizer pie in a Food and Wine Cookbook, Best of 2010. I made a couple of small changes. I didn’t care for the crust, it was a bit tough. I used my own pie crust recipe-worked like a charm. I did, however, love the idea for a spicy tart dip. The recipe suggested using buttermilk, but I always have plain yogurt on hand, so I made my version of it. The name really piqued my curiosity so I googled. Turns out these meat pies were popular in the late 1700’s in the small Louisiana town that shares the name. 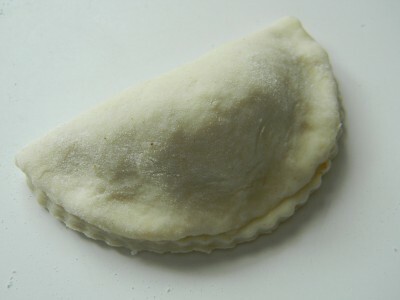 It is said that the meat pies were easy for working men to transport to work and were easy to eat. I LOVE food history! I enjoyed making these little appetizers but they were time consuming. I think it would make an interesting dinner (make them larger) and I think kids would dig it. (maybe cut back on some of the spice) I’d serve a nice green salad with a vinaigrette. 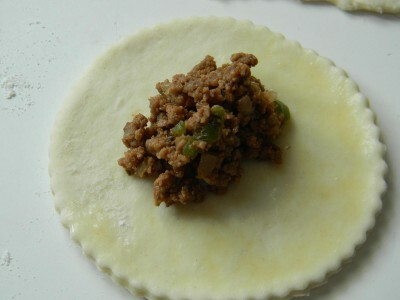 The sharp vinegar cuts the richness of the meat filling. Brown the meat in a little olive oil. 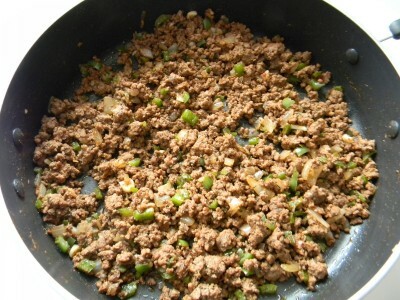 Add minced garlic, green pepper, and onion. Cook until vegetables are soft. Add tomato paste, cayenne pepper, ground cloves, dried thyme, ground coriander, allspice, sugar, and water. Add a couple of pinches of salt and a couple of dashes of Tabasco. Allow to cool completely. (be sure to do this, the crust dough will not fare well with warm filling) Prepare the egg wash and preheat the oven to 350′. Roll out a pie crust disc into a 12-14″ circle. Using a 4″ biscuit cutter, cut out as many circles as possible. Working one at a time, brush half of the circle’s edge with the egg wash.
Add a tablespoon of the cooled meat mixture to one side of the circle. Fold the circle over the meat and seal the edges. 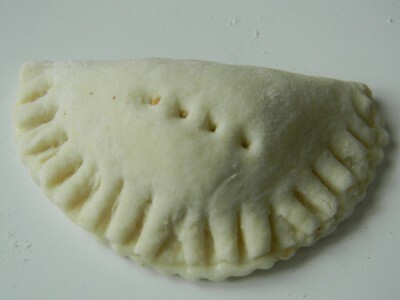 Crimp the edges with a fork and poke the center of the pastry with the fork to vent steam. Place on parchment lined cookie sheet. 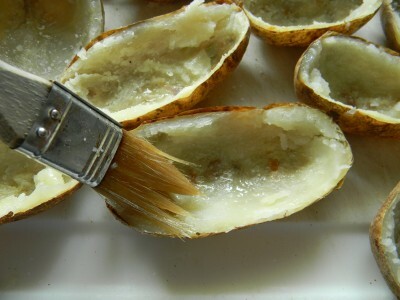 Brush the tops with the egg wash. Bake for 25 minutes. While they’re baking, prepare the dipping sauce. Enjoy! 1) Prepare crust and wrap discs in plastic wrap. Refrigerate for 30-40 minutes. 2) Heat a large skillet over medium heat and add olive oil. Add meat and cook until no longer pink, about 5 minutes. Add the garlic, onion, bell pepper, and bay leaf. Cook 7-9 minutes until veggies are soft. 3) Stir in tomato paste through water. Cook for 3-5 minutes. Discard the bay leaf and allow the mixture to cool. 4) Preheat the oven to 350’. Line a large cookie sheet with parchment paper, set aside. 5) Roll out the pie crust to a 14” round. Using a 4” biscuit cutter, cut out as many circles as you can. Brush the edge of half of the round with the egg wash, add a tablespoon of cooled meat mixture to one side of the circle. Fold over, press to seal. Using a fork, crimp the edges and poke the center of the tart to vent. Place on cookie sheet. Brush with the egg wash. Bake for 25 minutes or until golden brown. 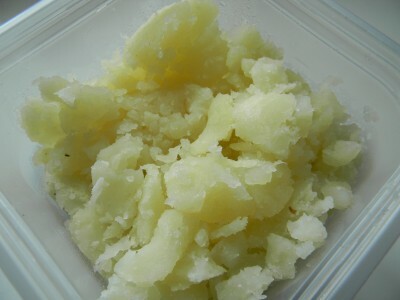 6) In a small bowl, whisk all ingredients until well blended. If sauce is too thick, thin out with a little milk. *Make a day or two ahead and warm in 350’ oven for 10 minutes. Whisk the sauce and serve.